If you are thinking about selling a home, you might want to take a lesson from the makers of the Yoshi Blade. 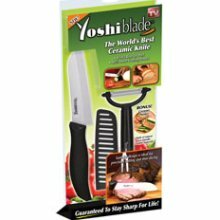 For those few readers who were never touched by the Yoshi Blade marketing steam roller, it is a simple, cheap ceramic knife that was mass-marketed through all the prime internet based channels. Most people were drawn, at one point or another, to check out the video of this miraculous cutting utensil. There are many things somebody selling a home could learn from the Yoshi Blade marketing team, but I will focus on the three that immediately come to mind. Exposure - If you expose your product to enough people, they will carry your message to the consumers you are trying to reach. These cheap knives sold millions ... but was it because they were so good? No, in fact, most Yoshi Blade reviews are not favorable. The knives break and chip easily, and they have to be treated like fine china or you will dull them. Nevertheless, millions sold due to proper exposure in marketing. Targeting - You have to know how to expose your product at the time and place where consumers are likeliest to make a purchase decision. They did not spend time and money promoting these at knife shows, newspapers, magazines or any other traditional methods for selling kitchen ware, instead they used infomercials, websites, and email targeting to achieve millions of knife sales. They did their homework, knew where there consumers could be found, and then blasted those marketing channels for spectacular results. Focus - If you are selling a home and decide to interview real estate agents about listing your home, you will hear a lot of good and a lot of bad ideas. It is easy to think "anything they do to try to sell my home is better than nothing," but that is simply not the truth. If a company has an outdated marketing plan, than they will spend most of their time doing the things that will not sell your home. Would you be surprised to know that fewer than 40% of all homes listed in the Tallahassee MLS will sell with the first agent hired by a home seller? No matter where your home is located, there is likely one best company to help you sell your home. Why? Because there is a regional real estate website that gets the bulk of the buyers who are ready to make a purchase decision. They are "lurking" on that site, waiting for a new great property to hit the market. If your home is properly staged to hit the market with that company, you will get sold faster and at a higher price. If you want to know more about selling a home, in any market, just drop me a note and we can schedule a time to find out how to best serve your needs.